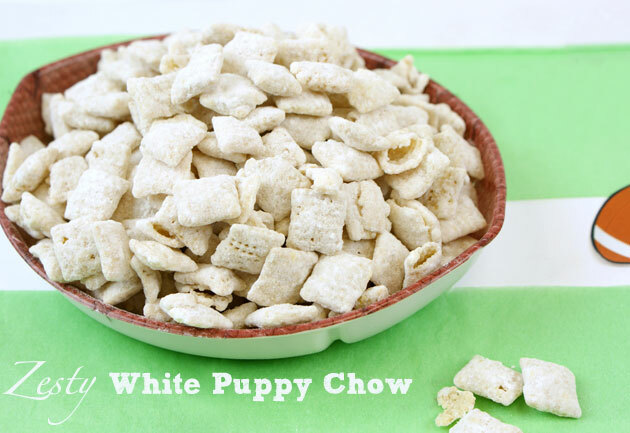 Whether you call it puppy chow or chex muddy buddies...this is the perfect kid-friendly snack that everyone will be munching on! The vanilla and fresh lemon zest give this recipe a sweet twist! 1. Place cereal in a large bowl (a large plastic bowl with a lid works best). 2. Sprinkle lemon zest over the cereal. 3. Melt Vanilla CANDIQUIK® Coating in Melt & Make™ Microwaveable Tray according to package directions. 4. Pour coating over the cereal and use a spatula to fold into cereal until evenly coated. 5. Add the powdered sugar and seal the top with the lid (or cover with plastic wrap) and lightly shake until thoroughly coated.